I was out on the Loket Tributary to the Black Rapids Glacier in the Alaska Range on September 3, 2014. About 6 inches to a foot of fresh snow helped make for some stunning contrast against the rock and sky. Unfortunately, It won't be safe to return until the snow is solid enough to support body weight over crevasses and moulins. This was the nicest day I've had out there this year! The Asgard Tor in evening light at the Granite Tors. Panorama from the Park Road in Denali National Park on an overcast, rainy, and windy day in September. And you know what? I'm fine with sitting out here on an overcast, rainy, and windy day like this. 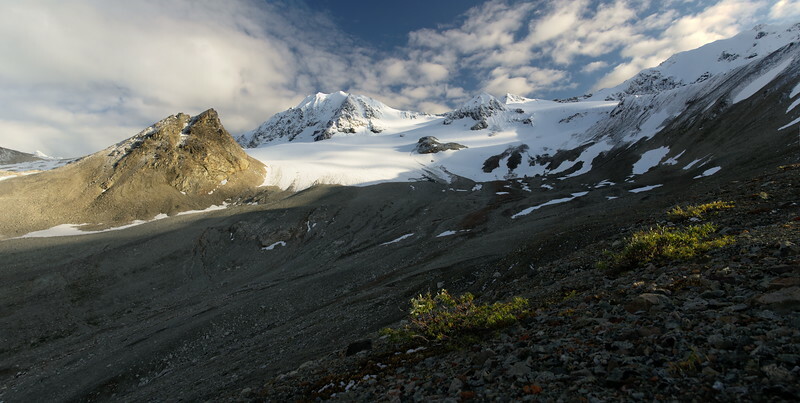 Peaks above the Loket Tributary in the Alaska Range. Mt. Shand in the Alaska Range from the Black Rapids Glacier. Cropped to print at 10"x40" at 300 dpi. A small, yet fast stream near the northern lateral moraine of the Black Rapids Glacier in the Alaska Range. McGinnis Peak on the right dominates the skyline in this area. 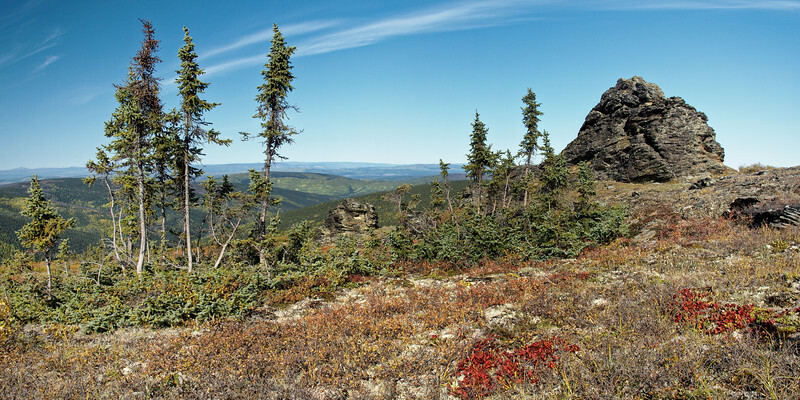 Stand of spruce on Murphy Dome, looking into the Chatanika Valley. 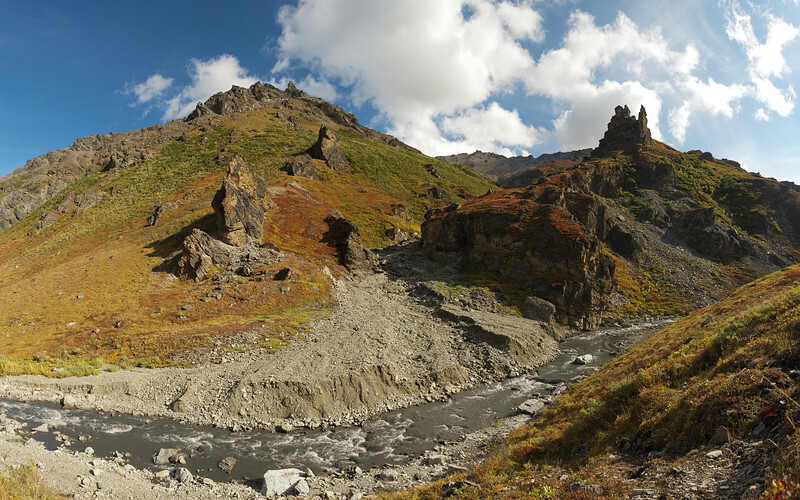 Rocky and colorful autumn landscape along the Savage River north of the Park Road in Denali National Park. You can get here by way of a spur trail off of the Savage Canyon Loop Trail. Getting to this spot and back adds roughly a mile to the two mile loop (just keep going north on the west side of the footbridge at the end of the loop). Keep going a bit further and you could find some cool waterfalls. The view from the top of US Creek Road in the White Mountains of Alaska. It was an incredibly hot in the early summer this year. My wife and I took the dog out here to try to cool off in Nome Creek, and we lucked out. There was still a sheet of aufeis on the water. This was my first time out here in the summer, the greens were spectacular! 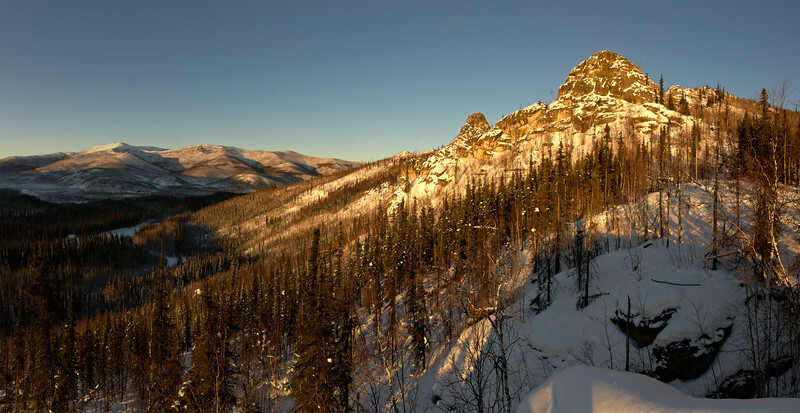 A rather chilly and windy hike led to golden afternoon light on Angel Rocks in the Chena River State Recreation Area. Just after midnight on June 7th, 2015. Gorgeous sunset on Birch Lake. Fall colors are taking over on Murphy Dome, just outside of Fairbanks, Alaska. 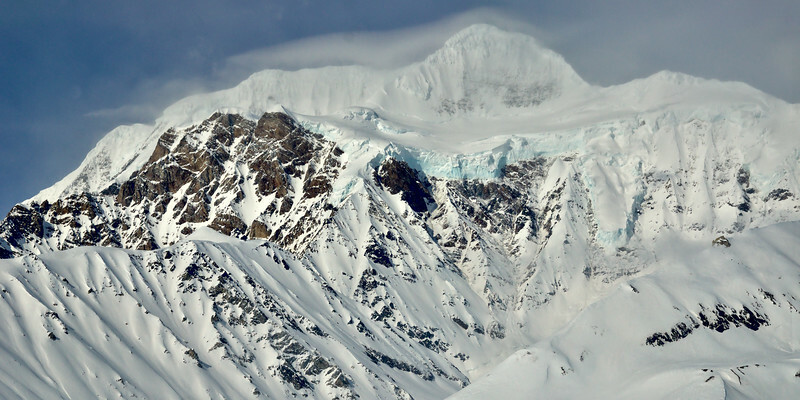 This is taken looking south over the Black Rapids Glacier in the eastern Alaska Range. The basin center left is the Trinity Basin, the main accumulation area for the glacier. Center right you can see the pothole field, leftover cauldrons that formed as crevasses healed after the glacier surged in 1936-1937. The depression center right is Aurora Lake, a large lake on the margin of the glacier that drains as an outburst flood, usually in June. A gorgeous morning, taken about 1 hour and 45 minutes before sunrise from the front of the Reichardt Building at the University of Alaska Fairbanks. A particularly stunning view of the Alaska Range with tall mountains (left to right) Hayes, Hess, and Deborah. Good print size would be 5"x20" or 6"x24" - requires crop on top or bottom. I photographed this awesome sight while doing field work out on the Black Rapids Glacier in the eastern Alaska Range. The view is to the southeast and you can see the Loket Tributary flowing into the main branch of the glacier center right. Living in Fairbanks (a little under 100 miles north of here) we get to see a lot of optical phenomena from ice in the atmosphere. 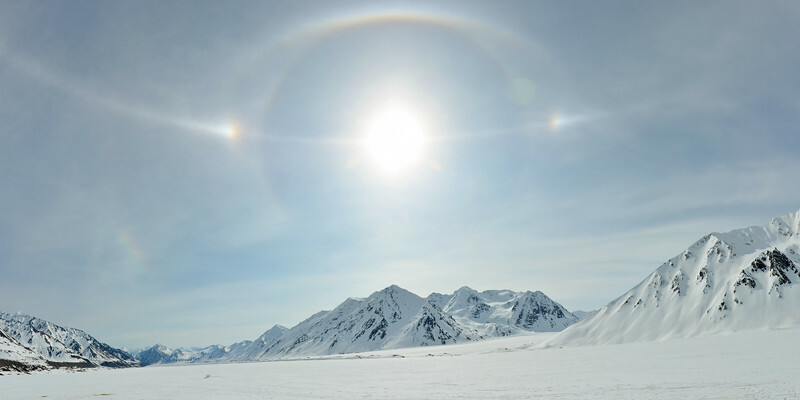 In the winter we frequently see halos and parhelia (sun dogs). It’s pretty rare to see the tangent arc and even rarer to see a parhelic circle – the line that continues ‘horizontally’ from the sundog. At times this made a full 360° circle around our heads from camp. The stitching together of this 14 image panorama was not fun and it isn’t perfect, but I think it came out nice enough. Water backs up behind a natural dam on the Black Rapids Glacier. This dam formed from one of 3 enormous landslides that cover the entire width of the glacier. 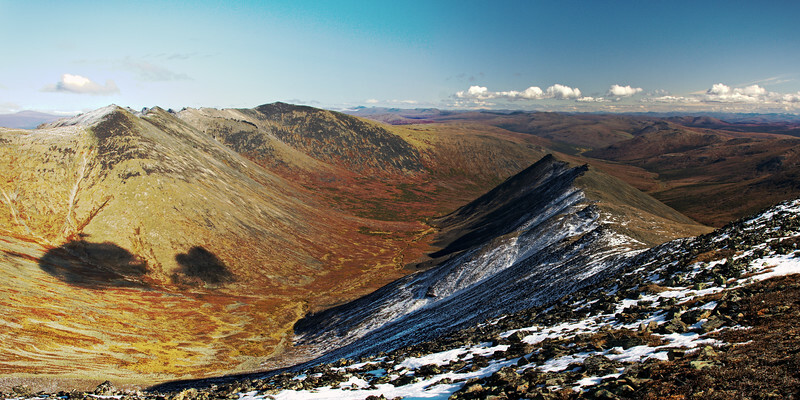 The landslides occurred in 2002 after a 7.9 earthquake on the Denali Fault that runs along the length of the Black Rapids Glacier. 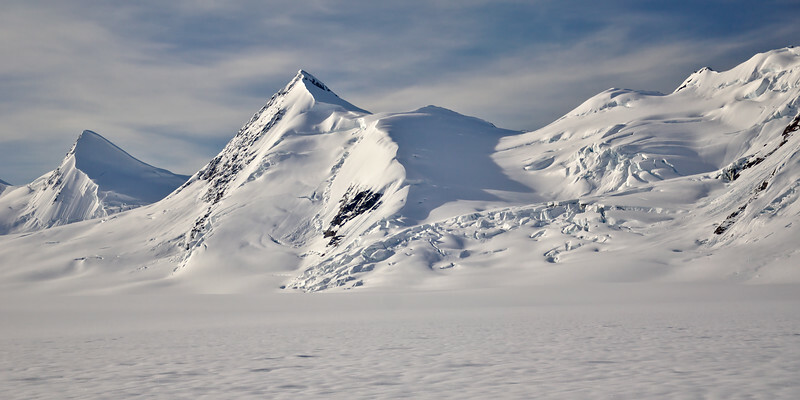 While the debris cover itself is not very thick, a few meters at most, the rock insulates the ice beneath it so there is less melt in the summer months compared to the surrounding ice. The height difference between the top of the debris here and the ice surface I took this photo from is due almost entirely to the difference in the amount of melt of insulated and non-insulated ice over the previous 11 years. Looking over the Savage River Valley in Denali National Park. Denali is on the horizon just up and left of the Park Road (on the far right). A perfect day in the Alaska Range! Cropped to print at 10"x30" at 300 dpi. An absolutely gorgeous day on Smith Lake in Fairbanks, Alaska. The trails were still wet and muddy, but it was still worth it to venture out. I love the cumulus clouds that start rolling in during the spring months in the interior. McGinnis Peak is on the right - Mt. Moffit is the little bright blob on the left barely poking above the ridge. This was taken the day after we got 8-10 inches of snow (in June!). It was such a pleasant sight to have a bit of blue sky show through the clouds! 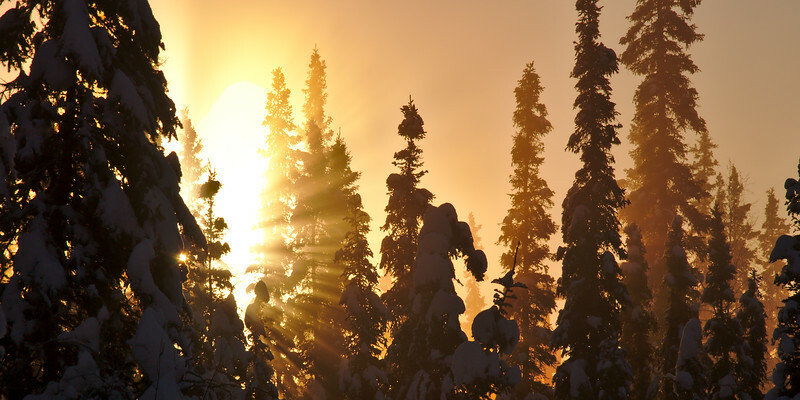 Spruce forest, low sun, ice fog. The Asgard Tor lies along the Granite Tors Trail. On a clear day the Alaska Range can be seen in the distance.